Half of adults can’t read above the 9th grade level. 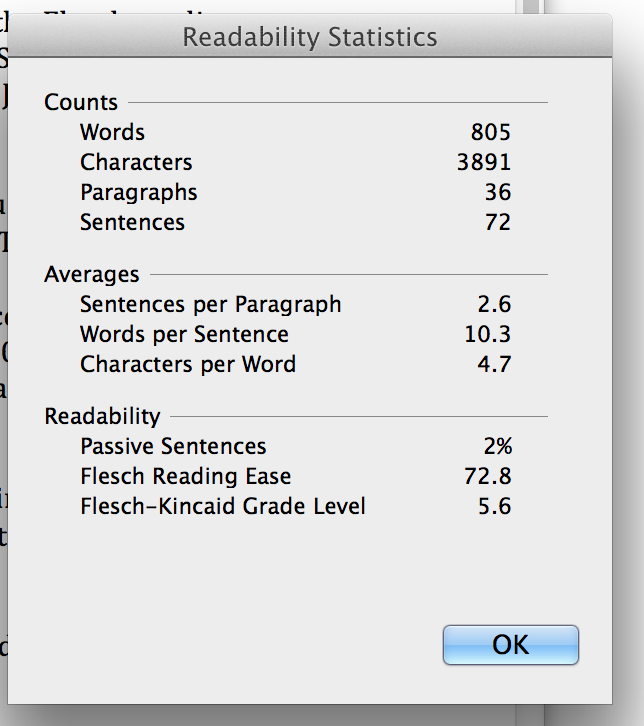 That is why you need this readability guide for your blog. Optimize Reading Ease to Better Engage Readers and Increase Your Impact. Short sentences may be the biggest secret weapon to win traffic, readers and trust. Used well, they help you look sharp. They get your message through. People want what’s easy to understand. If you use words to build an audience, reading ease helps you stand out. When your point is easy to see and understand, readers feel happy. People who search online are hungry to learn. Brief sentences help them grasp and use your text with less effort. That feels good! Short sentences offer great strength. We tend to overlook their power to attract and engage readers. It’s time to discover and harness the value of reading ease. Let’s improve our grip on this writing skill! Writing with shorter words, sentences and paragraphs does not mean you must dumb down your text. Nor must you cut your piece short. Feel free to write using the words you need; just remove what’s unnecessary. When you find a sentence packed with ideas, edit it into separate sentences. See if these serve your reader better. If a short word can replace a multisyllabic long one, swap it in. When a paragraph becomes a big block of text, break it up. Options include a simple line break, subheading, or image. Write like you might speak in conversation. Use phrases that seem natural to you. Concise text hooks readers. Take this example. Neil Patel’s blog post has 2,156 shares so far. It scores 65 on the a reading ease scale, and ranks at the 6th grade reading level according to Readable.io. It meets an important need, and it’s easy to read. That’s worth sharing! Reading ease matters so much, experts put tools at our fingertips to measure it. The renown Flesch reading ease scale is one such tool. Dr. Rudolf Flesch (with a PhD in Library Science!) developed it from of his passion for literacy. Flesch redefined readability when he published The Art of Readable English (1949). It introduced the Flesch Reading Ease Test, now used by millions of people. The test takes a minimum 100-word sample, and runs it rough a formula to standardize the results on a scale of 1 to 100. The formula counts words, syllables, and the number of sentences. Shorter sentences with shorter words score better. A score of 0 is very hard, 100 is very easy. A score of 60-70 signals plain English, which most 13 to 15 year olds can grasp easily. A score of 80-90 is easy to read. It’s conversational. To make the score’s meaning even clearer, the Flesch-Kincaid formula translates the Flesch score into a US grade level. A Flesch score of 65 translates to 8 or 9th grade reading level, for example. 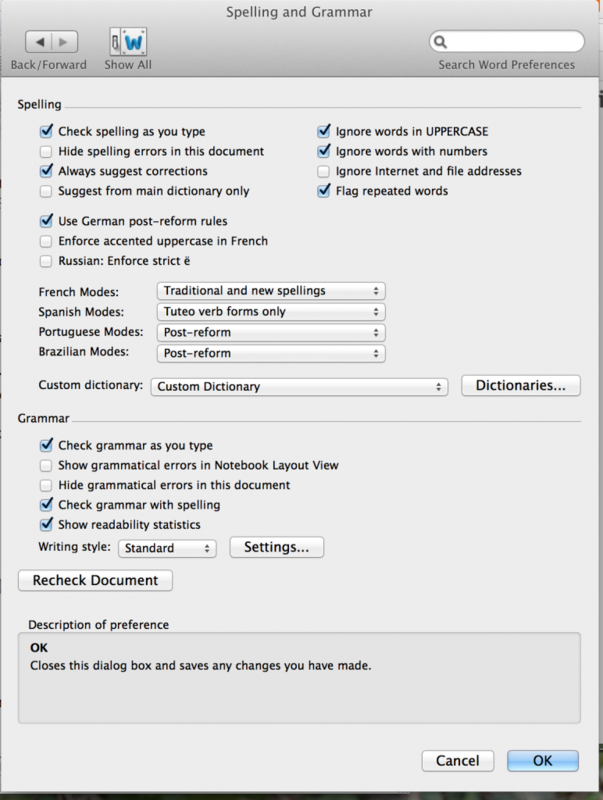 Want an online alternative to Microsoft Word? Readabile.io marks up your text with color-coded highlights. I liked their clear grading system, and help finding problem areas fast. 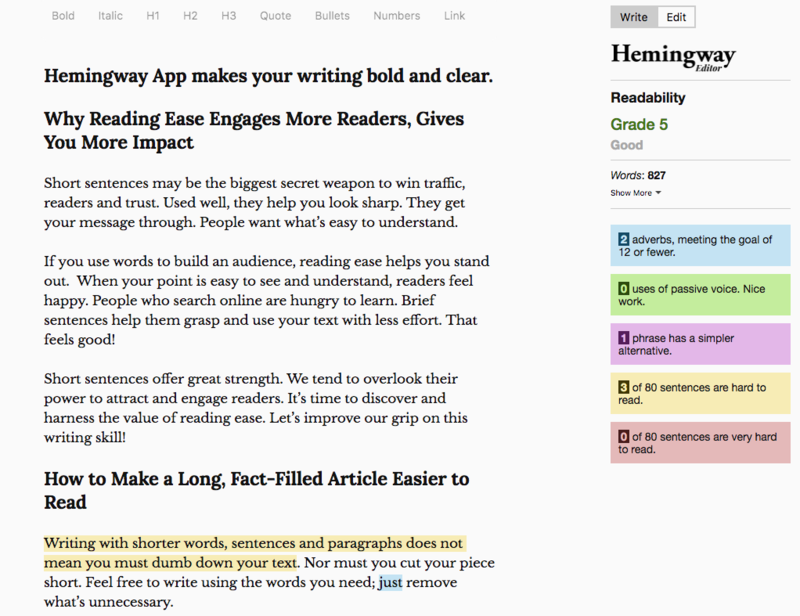 Hemingway is a popular online markup tool. I used the online version for free; the app is for sale. People want content they can use. That’s the main reason why reading ease matters. As search engines get smarter, they will get better at finding the best information to give people. When your content clear, helpful and a breeze to read, you deliver more value. That’s the kind of user experience anyone would want to deliver. Brief clear text is like a chocolate chip cookie. It’s packed with energy. It’s well defined. People ingest with glee. It triggers instant satisfaction and the urge to keep consuming. The quickest way to touch your web visitor’s heart is to make your truth as clear and simple as you can. Reading ease is good for your audience and good for your business. It strengthens value, invites trust, and entices your readers to want more. Can we guess if social media marketing is working for to you? We can by checking these numbers.